Did you find a Round Oak stove in a barn that you need identified? 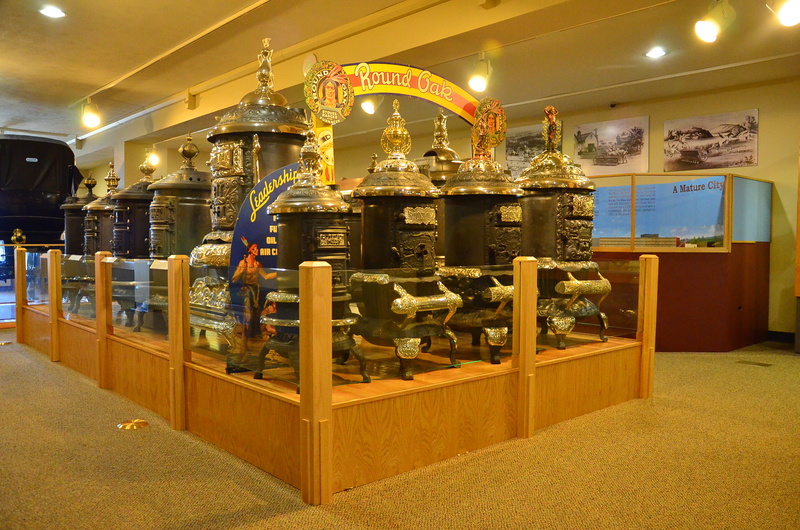 We provide some information below and the Dowagiac Area History Museum has the resources to help identify most heating stoves made by Round Oak in Dowagiac, Michigan. The Dowagiac Area History Museum does not appraise or value Round Oak stoves. There were many imitation ‘Oak’ stoves made over the years– the museum does NOT have information on the other ‘Oak’ stoves made by other manufacturers. If you have another company’s Oak stove, we do not have information. Round Oak also made hundreds of models of cookstoves for almost 50 years. There is a $25 fee to have your cookstove identified because it usually involves extensive research. To have your cookstove identified, email images of your stove to museum@dowagiac.org and staff will assist with identification. The book “Identification and Dating of Round Oak Heating Stoves” (Book Order Form) provides greater detail. For more detailed information on the history of the company, the books “Round Oak: A Good Thing From Doe-Wah-Jack” and “The Round Oak Stove People” provide detailed information on Round Oak and the people behind the company. Look at the stove’s shape and compare it to the identification pages at right. What kind of stove was it? 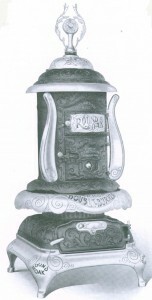 The original Round Oak stove (1871-1920s) was round and had a round base; the Air-Tight (1899-1947) was oval, short and had no firepot; the Square Base (1913-47) had a round body but square base; the Double Burner was similar to the Square Base but had a vent in the backside; and the Base Burner (1908-16) featured a nickel-plated and mica window body. Once you have identified the type of stove you have (Round Oak vs. Base Burner, e.g. ), look for a model letter on the doors or other parts. Stoves made prior to 1890 did not have a model letter and can be difficult to date. Round Oak manufactured “date-on-door” models from 1890-96, which featured the year of manufacture on the bottom feed door. Round Oak stoves manufactured from 1897 until the end of the company in 1947 had a model letter, usually located on the lower feed door. After identifying the type of stove and/or model, click on the link below to see images of stove models of that type. What model is it? Find your stove model and/or match your stove to the images provided. That should date your stove and show you how a completed stove looked when it was new! 1. The numbers (12, 14, 16, 18, 20, etc.) indicate the size and usually appeared before or after the model letter. The size of the stove was the diameter of the firepot. 2. After P.D. Beckwith died in 1889, Round Oak was incorporated as the Estate of P.D. Beckwith. 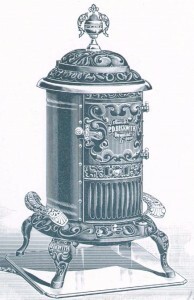 Beginning with the B-model stove in 1898, most stoves had “Estate of P.D. Beckwith” cast in it. You do not have P.D. 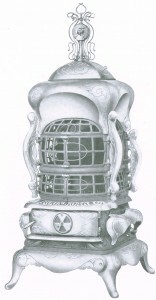 Beckwith’s personal stove.